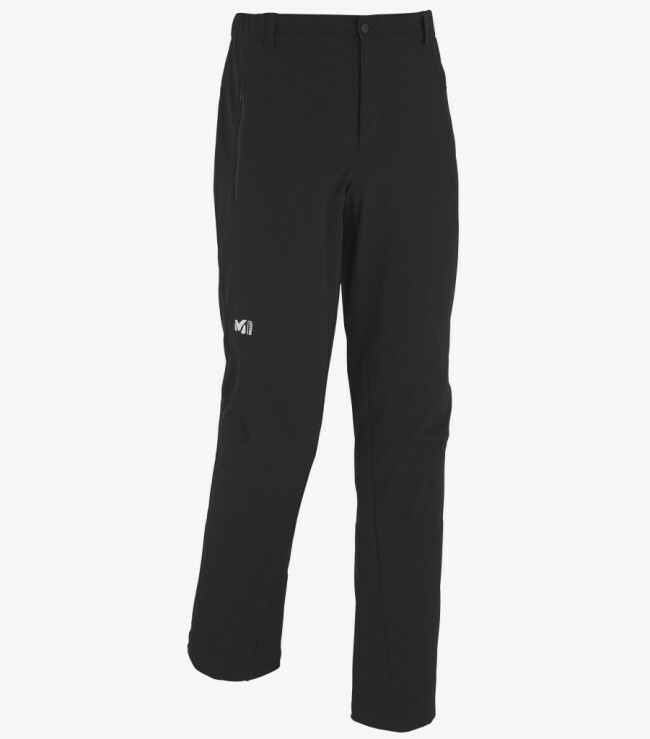 "Millet Alpine XCS Pant Black - Noir - breathable, stretch, abrasion resistant. Tested and approved, this lightweight softshell pant is designed for the alpine enthusiast and built for mountaineering and hiking in challenging environments. The Alpine XCS pant delivers high performance in challenging environments with abrasion resistance and ergonomics and offers great value for the feature set. The Extended Comfort Shell 100, recognized for its excellent abrasion resistance, is perfectly suited for vertical disciplines. Its 2-sided, 4-way stretch construction maximizes comfort, while its high-tenacity nylon facilitates moisture wicking to leave the skin dry. A long-lasting water repellency enhances protection. A minimalistic design shaves grams without sacrificing functionality. The Alpine Fit reduces bulk around the body without restricting movement and the seamless leg inseam and pre-shaped knees enhance mobility. One back safety pocket allows to rapidly grab useful, small items while on your way to the top. Go light and go far.